McCain Campaign: Today, Sen. John McCain picked up a total of 50 delegates from Michigan and Louisiana. Republicans met in both states to resolve the assignment of delegates to the Republican National Convention. In Louisiana's 47 delegates, 32 have siad they will vote for McCain with 3 others leaning toward McCain. The McCain campaign said 43 of Louisiana's delegates have signed pledges to vote for McCain. In Michigan, delegates may go unpledged. In soft delegate count, Mitt Romney's received 20 delegates and John McCain's 7 delegates. It appears, the McCain campaign has 18 delegates committed to voting for John McCain. Tags: delegates, Election 2008, John McCain, Louisiana, Michigan, presidential candidates To share or post to your site, click on "Post Link". Please mention / link to the ARRA News Service. Thanks! Anonymous Guest Article - We confirmed the data and proved the links: Something to pass along to our liberal friends. Most liberals won't take the time to confirm these figures as they want only to believe what the national news networks and celeb's say, but perhaps some will at least allow the information to remain somewhere in the back of thought process. Based on using the actual tax tables, here are examples on what the taxes were/are on various amounts of income for both singles and married couples. so let's see if the Bush tax cuts only helped the rich. Tags: 2008, Barack Obama, Bill Clinton, Hillary Clinton, income tax, President George Bush To share or post to your site, click on "Post Link". Please mention / link to the ARRA News Service. Thanks! This week, leaders of the U.S. Senate signaled that they are intent on giving more power to the United Nations, including the power to impose taxes, paving the way for ratification of the Law of the Sea Treaty. Wednesday, Feb. 13, the Senate Foreign Relations Committee passed by voice vote the Global Poverty Act (S. 2433), sponsored by Senator Barack Obama (D-IL). This feel good legislation commits the U.S. to spending 0.7 percent of gross national product on foreign aid, over and above what we already spend. The bill references the UN's Millennium Declaration (from 2000) which calls for countries to dramatically increase foreign aid, agree to banning “small arms and light weapons,” and sign on to many dangerous treaties, including the International Criminal Court, Kyoto Protocol, CEDAW, and the Convention on the Rights of the Child. The U.S. should have nothing to do with these awful treaties or the UN Law of the Sea Treaty (LOST). One of the worst aspects of LOST is the mechanism for imposing a global tax by requiring companies to pay a portion of their profits to the International Seabed Authority. If the Senate passes the Obama global tax bill, LOST can't be far behind. Since President Bush has made his support for LOST well known, we imagine he would be willing to sign the global tax legislation, hoping to speed up ratification of LOST. In fact, in his 2009 budget request, President Bush included a request for $5 million for LOST and the international tribunal established by the treaty. Senator David Vitter (R-LA) questioned Secretary of State Condoleezza Rice at Wednesday's committee hearing as to why taxpayer dollars should be going to "a new bureaucratic international organization that has not been endorsed by the U.S. Senate." Secretary Rice reiterated the administration's commitment to ratification of LOST. Take Action: The Obama global tax bill or the Law of the Sea Treaty could come up on the Senate floor anytime! Be sure to Contact your senators today and tell them to oppose both pieces of legislation. Also, Senators will be in their home offices the week of February 18. Please stop by or schedule an appointment with them to let them know you are watching their position on the Global Tax bill and LOST! Tags: Barack Obama, Global tax, Law of the Sea Treaty, legislation, LOST, UN, US Senate, Condoleezza Rice To share or post to your site, click on "Post Link". Please mention / link to the ARRA News Service. Thanks! Little Rock health care executive Tom Formicola is forming an exploratory committee for a potential run against Sen. Mark Pryor (D), who is seeking a second term in November and has not yet drawn any major party opponents. 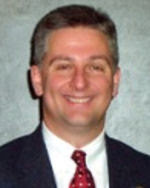 Formicola lost the Republican primary for an Arkansas congressional seat in 2006. Dennis Milligan, chairman of the Republican Party of Arkansas, said Thursday that Formicola approached him after Milligan initially said he thought the GOP would be unable to field a candidate against Pryor. Formicola, 48, is the sales and operations manager for Medtronic Inc.
ARRA News: Arkansans understands the heartache of losing family and friends in a school shooting. Our hearts go out to the families and friends of the students who were killed at Northern Illinois University yesterday. Join use in praying for the students, faculty and staff at Northern Illinois University in DeKalb, IL where the death toll is now at six dead and 18 injured. The campus held a prayer vigil last night. This was the fourth shooting in U.S. schools this week. Pray for healing for the wounded, for comfort for those who have lost loved ones and for speedy recovery for the entire community. May we find peace in the words of 2 Corinthians 1:3-5, which says, Praise be to the God and Father of our Lord Jesus Christ, the Father of compassion and the God of all comfort, who comforts us in all our troubles, so that we can comfort those in any trouble... For just as the sufferings of Christ flow over into our lives, so also through Christ our comfort overflows. Tags: Arkansas, Illinois, prayer, school, shooting To share or post to your site, click on "Post Link". Please mention / link to the ARRA News Service. Thanks! by Gary Bauer, Campaign for Working Families: There can be no doubt that Senator Barack Obama has become a huge political phenomenon. Just ask a stunned Hillary Clinton, who sees her dream slipping away. His crowds are huge, and their adoration for him almost resembles a religious fervor rather than mere political support. In fact, even some media liberals are beginning to get uncomfortable about what they are witnessing. Joel Stein, who writes for the Los Angeles Times calls it "the cult of Obama." Jake Tapper of ABC News has referred to the "Helter-Skelter cultish qualities" of "Obama worshippers." Charles Krauthammer dealt with this phenomenon in his column in the Washington Post this morning and zeroed in on Senator Obama's soaring, but puzzling, rhetoric that garners such an emotional reaction. He cites Obama lines like this: We can "remake the world as it should be," and "a hymn that will heal this nation, repair this world, and make this time different than all the rest." I am used to politicians promising they will give me free health care, but "repair the world" and make our age "different than all the rest"? Needless to say, the rhetoric is not matched with any specifics. Senator Obama's only solution so far to Islamofacism is to suggest we abandon our commitments in the Middle East and call a conference for Muslim nations to talk. His economic plan is boiler plate liberalism - take more money from people who are doing well, launder it through the Washington bureaucracy and give what's left, after the bureaucracy skims off its share, to the needy. He has come very close to saying that he would confiscate the profits of oil, insurance and drug companies and use it to fund "free" housing, job progress, etc. If he actually does these things, the consequences would be devastating. Yet for now, his "spell" still works its magic. Senator Obama, who is promising a new day, has already bought into the old ways - he has buried dozens of pork barrel projects into appropriation bills to help his own state of Illinois. The question of this campaign will be whether facts like that will matter. I believe they will matter, but it isn't going to be easy. President George Bush, Comment to News: We also discussed a serious problem facing our country, and that is the fact that house leaders blocked a good piece of legislation that would give our intelligence community the tools they need to protect america from a terrorist attack. America' s citizens must clearly understand that there is still a threat on the homeland. They would like to do us harm, and we have got to get our professionals the tools they need to be able to figure out what the enemy is at so we can stop it. The senate passed a good bipartisan bill that makes sure our intelligence community has the tools necessary to protect america from this real threat, and I want to thank you all. And thank the democrats in the United States Senate who worked closely to get a strong piece of legislation with a 68-vote majority of the Senate. When it comes to the House of Representatives, it was blocked. By blocking this piece of legislation, our country is more in danger of an attack. By not giving the professionals at the tools they need, it is going to be a lot harder to do the job we need to be able to defend America. It does matter. In matters for a variety of reasons. It matters because intelligence officials will not have to unnecessary to get as much information as a possibly can to protect you. And it matters because these telephone companies that were to collaboratively help us to protect the American people are afraid they're going to get sued. The American people have got to understand that these losses make it harder -- these lawsuits make it harder to protect you. By blocking this legislation, our professionals tell me they do not have all the tools they need to do their job. So now the House and Senate are off on a 12-day recess. When they come back from that recess, the House leaders must understand that the decision they made to block a good legislation has made it harder for us to protect you, the American people. We expect them to get a good bill as soon as possible. Tags: FISA, President George Bush, US House To share or post to your site, click on "Post Link". Please mention / link to the ARRA News Service. Thanks! On The Floor: NADA, ZILCH, NOTHING - Congress recessed without fully protecting the United States! The Senate did take necessary action on FISA but the House Democrat leadership blocked taking up the Senate-passed FISA reform bill even though a majority of the House supported the bill. This means that the temporary FISA modifications passed last August will expire at midnight tonight. The United States is now more at risk to terrorists. Yesterday, after failing again to address FISA, the Democrats took time to vote to hold White House Chief of Staff Josh Bolten and former White House Counsel Harriet Miers in contempt and passed a number of "noncontroversial" bills. The Senate will reconvene today as a pro forma session at 10 AM today as a means to block the President from calling them back into session and to prevent recess appointments. They will repeat this devious practice again on Tuesday and then on Friday. The Senate will return on the Feb 25th. With the House dragging behind and failing in their efforts on matters of substance, the Senate will resume consideration of the American Indian health care bill (S. 1200). One wonders what other items the Democrat leadership will schedule to damage the American people or to fill their time. 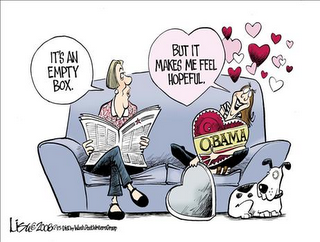 Tags: Barack Obama, political cartoon, Valentine's Day To share or post to your site, click on "Post Link". Please mention / link to the ARRA News Service. Thanks! On a prior post this morning, we commented: "This Democrat Congress’ continued mismanage of critical national security questions is beyond belief and reason. Reid & Pelosi have continued to be absolute failures as leaders. They speak with deceit and malice and are totally inept!" Yesterday and today, House Democrats "fiddled" and allowed national security to be placed at risk. They discussed inane issues of no importance to our Nation while refusing to address FISA. Tonight they left Washington D.C for a 12 day recess,allowed FISA to expire, and placed our country at risk without the ability to legally monitor international terrorists’ calls to and through the United States. The FISA bill passed by the Senate was bi-partisan but the House leadership refused bi-partisan action. President Bush, scheduled for a trip to meet with several African leaders, offered to postpone his important trip to work with Congress on FISA. But, the House Democrat leadership refused. And to top it off, even though the House will recess for 12 days, the Democrat leadership established a devious method to prevent President Bush calling them back into session to work on the FISA bill. The Democrat Congressional leadership is having one or two members of Congress to appear every three days to call the House or Senate back into session and to then close the session. Thus, they prevent themselves from being called back to work and prevent the President from making recess appointments. Tags: FISA, Harry Reid, Nancy Pelosi, US House To share or post to your site, click on "Post Link". Please mention / link to the ARRA News Service. Thanks! At a news conference in Boston, former Gov. Mitt Romney endorsed John McCain for the Republican Party's presidential nomination and asked his delegates to support McCain. Romney's action moves McCain closer to the 1,191 delegates needed for the nomination. Romney said, "I am honored today to give my full support to Senator McCain's candidacy for president of the United States. This is a man capable of leading our country at a dangerous hour.'' McCain said he was "very honored'' to have Romney's support and thta they will "join together now and travel this country'' to campaign for the general election. Tags: Election 2008, endorsement, GOP, John McCain, Mitt Romney, presidential candidate, Republicans To share or post to your site, click on "Post Link". Please mention / link to the ARRA News Service. Thanks! Estimates by the independent, non-partisan greenpapers.com, has McCain with 814 delegates and Romney with 175 delegates before suspending his campaign. An AP summary give McCain 843 delagates and Romney 280 delegates. Delegate are covered by rules set by individual state GOP, and Romney's delagates are not absolutely bound to supporting McCain. Former Gov. Mike Huckabe, with 215 delegates, emphasized this point today and indicates he is continuing his campaign. McCain is lead in polls in some of the largest states with contests coming in the next few weeks. 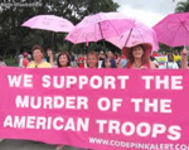 Bill Smith, ARRA Editor: I rejoiced with other military retirees upon learning of the death of the murderer of our fellow comrades and friends. I pray that our fellow comrades may now rest in peace and that Imad Mughniyah suffers eternity in hell! The below words written by Gary Bauer are a more balanced summary than my would be invective comments against this terrorist who should have been eliminated years ago. Gary Bauer: Passions are running high right now at the height of an intense political season. But in spite of any disagreements we may have, as Americans we can all celebrate today's news that a key Hezbollah terrorist has been brought to justice. According to multiple press reports, Hezbollah Deputy Secretary General Imad Mughniyah was killed in a bomb blast last night in Damascus, Syria. Mughniyah was a terrorist mastermind long sought by the U.S. and Israel, and included on the FBI's most wanted list. The U.S. had placed a bounty of $25 million on him, the same amount put on Osama bin Laden's head, and with good reason. Mughniyah's list of atrocities is well known. He is believed to have masterminded the 1983 attack on the U.S. Marine base in Lebanon that killed 220 Marines and 20 more American personnel. He was indicted for his role in the 1985 hijacking of TWA Flight 847 from Athens to Rome. Mughniyah and his thugs diverted the plane to Beirut and demanded the release of 700 prisoners held by Israel. The stand-off lasted 17 days, and when Mughniyah felt his demands were being ignored, the hijackers shot and killed Navy Diver Robert Dean Stethem and dumped his body out of the plane onto the tarmac below. Mughniyah is also believed to be responsible for the 1992 attack on the Israeli embassy in Buenos Aires, Argentina, that killed more than two-dozen people and another attack in 1994 at a Buenos Aires Jewish center that killed nearly 100 people. According to the Associated Press, his last known public appearance was to attend his brother's funeral in December 1994. He has been in hiding ever since but reportedly met with Iranian "president" Mahmoud Ahmadinejad during the latter's official visit to Syria in 2006. Needless to say, his assassination is sending shock waves throughout the Middle East. While Israel is denying any responsibility for his death, Danny Yatom, a former Mossad director, hailed the assassination as "a great achievement for the free world." Yatom added: "Mughniyah was one of the most dangerous and cruel terrorists of all time. There are numerous intelligence agencies and countries that have been pursuing him, and the one that was successful in reaching him [has proven itself] to have a high intelligence and operational capability. Whoever can take him out can take out anyone in Hezbollah." My friends, the evil of Islamofascism is real. Israeli civilians are living daily with the threat of rockets and missiles slamming into schools, homes and hospitals. The thugs who terrorize Israel have attacked us too - our Marine barracks in Lebanon, our embassies in Tanzania and Kenya, the USS Cole in Yemen, the World Trade Center Towers and the Pentagon. The ideology of death that motivates young Muslim men and women to become homicide bombers in Israel is the same ideology that leads young Muslim men and women to become homicide bombers in Iraq. Israel cannot negotiate with enemies who refuse to recognize her right to exist. America cannot negotiate with enemies who demand we "convert or die." The culture of death that is so carefully nurtured in the Muslim world must be defeated by any means possible. I hope and pray that more moderate Muslims will reject this evil ideology and defeat it peacefully. If not, free nations must be prepared to fight it and defeat it by force. 1,191 delegates are needed for the nomination. Despite the apparent favorable mathematical position for McCain, with Mike Huckabee still campaigning, John McCain must continue to compete actively in the upcoming states, including Wisconsin, Washington, Ohio, Texas, Vermont and Rhode Island. With delegates being held by other former candidates and by Huckabee, if McCain fails to garner 352 of the remaining 774 delegates, then a brokered convention will be at hand at least in the initial voting rounds. With Fred Thompson endorsement of McCain a few of his delegates could be released to McCain. If Huckabee does well in the final primaries, Mitt Romney, who suspended his campaign but did not withdraw, could become a key player with his delegates in the nomination process. Based on Romney's prior CPAC statement, he would lean to a decision that provides for the the greatest national security for Americans. Tags: delegates, Fred Thompson, GOP, John McCain, Mike Huckabee, Mitt Romney, presidential candidates, Election 2008 To share or post to your site, click on "Post Link". Please mention / link to the ARRA News Service. Thanks! Tags: Homeland Security, illegal aliens, illegal workers, IRS, John Boozman To share or post to your site, click on "Post Link". Please mention / link to the ARRA News Service. Thanks! ANIMAL OWNERS MEET IN ATKINS TO DISCUSS ANIMAL IDENTIFICATION AND FREEDOM TO FARM BILL The Arkansas Animal Producer's Association (ARAPA) is holding a Farm Premises Identification (PIN) and National Animal Identification System (NAIS) state wide informational meeting. It will be held at 3:00 to 6:00 PM, Sunday, March 2, 2008, at the Atkins High School Auditorium located just south of I-40 in Atkins. This is open to the public and all state legislators have been invited. ARAPA has several speakers lined up including well-known NAIS expert Doreen Hannes from Missouri and Ark. Congressman Roy Ragland who will talk about ARAPA's Freedom to Farm Act bill. This important meeting will provide information for owners of cattle, bison, horses, burros, mules, hogs, goats, sheep, exotics, fowl, deer, elk, alpacas, and llamas that will assist them in determining if they will participate in a voluntary PIN/NAIS and actions that can be taken to prevent a mandatory PIN/NAIS. The public may ask questions and offer comments. Other speakers include private property rights spokesman/ARAPA member Tim Smith who will talk about Agenda 21 and the connection to the NAIS. ARAPA member Mary Rivera will speak on her work in the state's Quorum Courts and securing resolutions against the NAIS. Tags: Animal Id, ARAPA, Arkansas, Arkansas Animal Producer's Association, NAIS, National Animal Identification System To share or post to your site, click on "Post Link". Please mention / link to the ARRA News Service. Thanks! "There is a greater chance that I would dye my hair green and get tattoos all over my body and do a rock tour with Amy Winehouse than there is that I would run for the Senate. . . . So, let me put that one to rest. ... Ain't happening, not running for the Senate. Done deal. Absolutely no way." Tags: Arkansas, Mike Huckabee, Mike Pryor, presidential candidate, US Senate To share or post to your site, click on "Post Link". Please mention / link to the ARRA News Service. Thanks! On The Floor: Senate reconvened at 9:30 AM today and began an hour of morning business. Yesterday, the Senate finally passed the FISA reform bill with a strong bipartisan vote of 68-29. The Senate rejected six amendments to the FISA bill. Among those were an amendment which would have stripped the provisions granting immunity to telecommunications companies that cooperated in surveillance operations and another which would have allowed lawsuits over such surveillance cooperation but substituted the federal government as a defendant. At 10:30, the Senate is to hold a cloture vote on the conference report for the fiscal 2008 intelligence authorization bill (H.R. 2082). The White House has threatened to veto the bill over a provision, inserted at the last minute by Democrats during conference negotiations, which attempts to limit CIA interrogation techniques. Sen. Bond will oppose cloture on the bill because [r]equiring the CIA to follow the Army Field Manual would allow terrorists to know what kind of techniques will be used against them. Later in the day, the Senate could return to the American Indian health care bill (S. 1200). Tags: FISA, Harry Reid, Mitch McConnell, US Congress, US House, US Senate, Washington D.C. To share or post to your site, click on "Post Link". Please mention / link to the ARRA News Service. Thanks! Update: FISA, S. 2248, Passes Senate 68-29 with Immunity for Telecoms. The bill must be reconciled with the House bill, which contains no immunity. The photo of the WTC being attacked by terrorists is used today as a reminder of why FISA is important in monitoring terrorist communications. If you do NOT believe terrorists have already, are currently, and will in future seek to attack the United States, you are denying reality. Why are some in Congress protecting the speech of terrorists outside the US who are communicating with people within the US? Why to they desire to punish businesses and their employees for cooperating with Government orders required to monitor international terrorists? When did some in Congress become more interested in supporting "trial lawyers" than in protecting American lives and property? Lesson learned: being elected to Congress does not make a person either a patriot or a friend of the American people. On The Floor: The Senate reconvened at 10 AM today and resumed consideration of the FISA reform bill (S. 2248). As many as 8 amendments could be voted on. Once the amendments are worked through, the Senate may finally pass the FISA legislation. Among the amendments to the FISA bill to be considered is one by Sen. Russ Feingold (D-WI) which would strip immunity for telecom companies from the bill. Another would substitute the federal government as a defendant in lawsuits against telecoms stemming from surveillance. Attorney General Michael Mukasey and Director of National Intelligence Mike McConnell have recommended that the president veto the bill if either of those amendments were to pass. Yesterday, Senate Majority Leader Harry Reid filed cloture on the conference report for the fiscal 2008 intelligence authorization bill (H.R. 2082). The Senate could consider this bill after the FISA bill is cleared. There remains some controversy over the intelligence bill, as it contains interrogation language which the White House objects to. Later in the week, the Senate is expected to return to an American Indian health care bill (S. 1200). From Senate & News Sources: On the FISA reform bill. Roll Call reports, “Intelligence Chairman Jay Rockefeller (D-W.Va.) appears to have enough votes today to beat back amendments that attempt to strip his bill of lawsuit immunity for telecommunications companies . . . .” Assuming all goes well, the Senate is likely to pass the bipartisan Intelligence Committee bill with few modifications later in the day. CongressDaily notes that “attention will turn immediately to the House, where trying to complete a final bill overhauling the Foreign Intelligence Surveillance Act could be a contentious and complicated chess game that could extend beyond a critical deadline at the end of the week.” The latest extension of the Protect America Act, designed to temporarily correct issues with the FISA law that the current bill will address over the long term, expires on Friday. The House could pass the Senate bill, thus eliminating the time pressure, but Roll Call reports, “[b]ecause the immunity provision will likely remain intact, the House is expected to balk.” In that case, Reid has prepared three different extensions of the Protect America Act. Another extension should not be necessary because Congress has been aware of problems with FISA since last spring and has had the Senate Intelligence bill to work with since October. A time-consuming conference with House-passed legislation could put our ability to gather intelligence on terrorist threats at risk. Democrats plan to blame Republicans should this happen, but it is the Democrats who have dragged their feet and mismanaged floor time, causing Congress to repeatedly run up against deadlines to reauthorize surveillance programs. Notable Democrats’ mismanagement hasn’t been limited to FISA. On Friday, Reid backed out of a unanimous consent agreement he’d negotiated with Sen. Tom Coburn (R-OK). Roll Call noted the significance of this: “UC agreements are one of the core rules of the Senate and are used on a daily basis to keep the chamber from becoming bogged down in procedural votes and filibusters.” In another example, The Hill reports that Reid used a delaying tactic to attempt to protect Democrats from having to vote on a bill that would have held the city of Berkeley to account for its city council’s treatment of Marine recruiters. Tags: Berkeley, FISA, Marines, terrorism, US Congress, US House, US Senate, Washington D.C. To share or post to your site, click on "Post Link". Please mention / link to the ARRA News Service. Thanks! ALERT from American Land Rights Association: Having been slapped down by the U.S. Supreme Court's recent decision that the words "navigable waters" in the Clean Water Act limited federal agencies to regulation of navigable waters only. Democrats and liberal Republicans in Congress are striking back. They are attempting to pass the Clean Water Restoration Act of 2007 (HR2421 and S1870) that would amend the 1972 Clean Water Act and replace the words "navigable waters" with "waters of the United States." Further, it defines "waters of the United States" with such breathtaking scope that federal agencies would be required to regulate use of every square inch of the U.S., both public and private . . . [Read More] Obviously, those behind this legislation have only contempt for the Constitution, limited government and private property rights. Tags: big government, clean water, Clean Water Restoration Act, property rights, water To share or post to your site, click on "Post Link". Please mention / link to the ARRA News Service. Thanks! Lou Barletta for Congress - Hazleton Mayor Lou Barletta, who has gained a national following with his get-tough approach to illegal immigration, is running for Congress. Barletta announced Thursday that he will seek the Republican nomination to challenge incumbent 12-term Democratic Rep. Paul Kanjorski, who represents a heavily Democratic district in northeastern Pennsylvania . . . "I realized that I'm not just fighting for Hazleton any more. I'm fighting for people all over the country who want their voices heard," Barletta said. "I've done as much as I can fighting illegal immigration as the mayor of a city. I need to take this fight to Washington, because that's where the problem needs to be fixed." . . . [Read More] ARRA Editor Comment: We are pleased to see Mayor Barletta running for Congress. As background, we reported previouslythe following: Hazleton immigrant law voided by judgeDo you agree with Hazelton or the Court? See also: Lou Barletta makes it official! Tags: candidate, Hazleton, PA, Pennsylvania, immigration reform, Lou Barletta, Pennsylvania To share or post to your site, click on "Post Link". Please mention / link to the ARRA News Service. Thanks! “There haven’t been gains, Wolf,” the speaker replied. “The gains have not produced the desired effect, which is the reconciliation of Iraq. This is a failure. This is a failure. Tags: al Qaeda, Iraq War, John Boozman, Nancy Pelosi, troop surge To share or post to your site, click on "Post Link". Please mention / link to the ARRA News Service. Thanks!